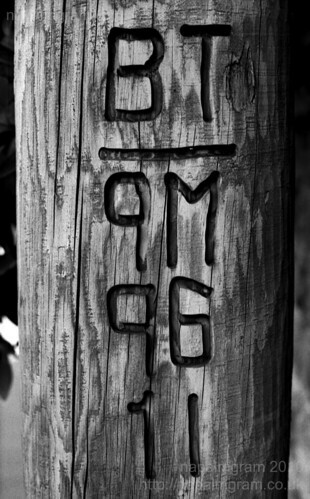 Carved/branded telegraph pole in Nottingham’s Mapperly Park. Guessing BT is for British Telecom, but no idea for the rest. Doesn’t seem to be on every telegraph pole, so guessing it must mean it’s some sort of wiring hub? Trying to play around with film a bit. So in this case the film (Ilford FP4+ 125) was actually pulled to 64 and then developed as normal (Ilford ID11 1:1 for 11 minutes). Quite liking the tones and detail that’s coming out of it.